90 SMT Magazine • December 2017 Ventec Seeking U.S. Product Manager for tec-speed Want to work for a globally successful and grow- ing company and help drive that success? As a U.S.-based member of the product and sales team, your focus will be on Ventec's signal integrity ma- terials, tec-speed, one of the most comprehensive range of products in high-speed/low-loss PCB ma- terial technology for high reliability and high-speed computing and storage applications. Combining your strong technical PCB manufacturing and de- sign knowledge with commercial acumen, you will offer North American customers (OEMs, buyers, designers, reliability engineers and the people that liaise directly with the PCB manufacturers) advice and solutions for optimum performance, quality and cost. Skills and abilities required: • Technical background in PCB manufacturing/ design • Solid understanding of signal integrity solutions • Direct sales knowledge and skills • Excellent oral and written communication skills in English • Experience in making compelling presentations to small and large audiences • Proven relationship building skills with partners and virtual teams This is a fantastic opportunity to become part of a leading brand and team, with excellent benefits. 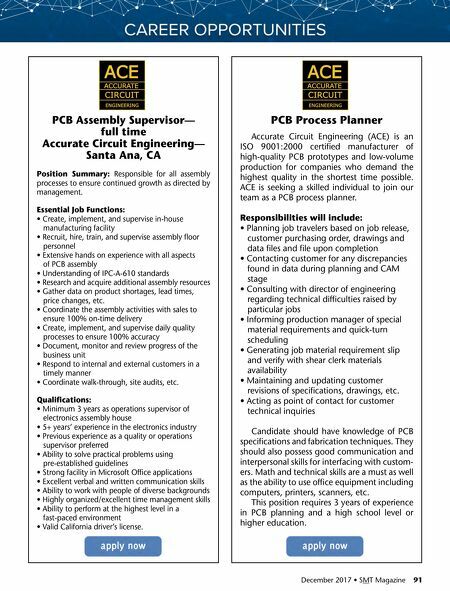 Please forward your resume to jpattie@ventec-usa.com and mention "U.S. Sales Manager—tec-speed" in the subject line. 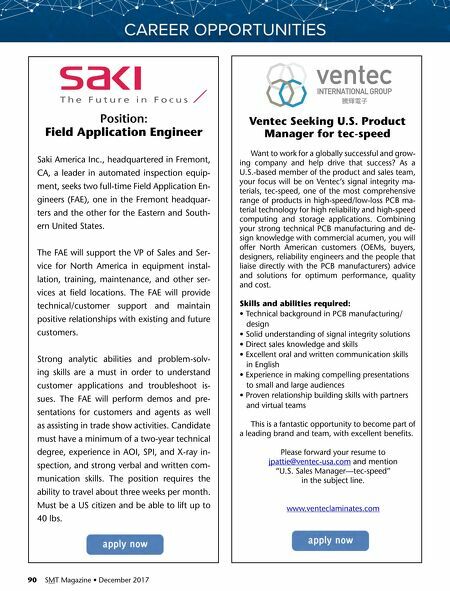 www.venteclaminates.com Position: Field Application Engineer Saki America Inc., headquartered in Fremont, CA, a leader in automated inspection equip- ment, seeks two full-time Field Application En- gineers (FAE), one in the Fremont headquar- ters and the other for the Eastern and South- ern United States. The FAE will support the VP of Sales and Ser- vice for North America in equipment instal- lation, training, maintenance, and other ser- vices at field locations. The FAE will provide technical/customer support and maintain positive relationships with existing and future customers. Strong analytic abilities and problem-solv- ing skills are a must in order to understand customer applications and troubleshoot is- sues. The FAE will perform demos and pre- sentations for customers and agents as well as assisting in trade show activities. Candidate must have a minimum of a two-year technical degree, experience in AOI, SPI, and X-ray in- spection, and strong verbal and written com- munication skills. The position requires the ability to travel about three weeks per month. Must be a US citizen and be able to lift up to 40 lbs.